This so-called "fear index": Are investors interpreting it correctly? When markets are calm and stable and investors are beating their chests happily as stock indices creep upward and upward, there is a market metric, an index, that often gets less attention. It exists on the fringes of market-data updates and reports. Meanwhile, finance purists and market watchers study it. Hedge funds and "innovators" in structured finance look for ways to make money trading it or selling it. Like other metrics and indices in finance, it was born to be a convenient measure to understand what is going in capital markets. This convenient measure is supposed to quantify market fluctuations--a quick way to size up volatility in equity markets. It's the VIX index, which in recent weeks has hovered about 19-20. With equity markets swirling and swooning upward and downward in early 2018, the VIX index comes to the forefront. Until recently, the index might have been perceived as moth-balled. When markets seem "violent," VIX numbers, because markets are more volatile, rise sharply. The media will then decide to headline the rise of the index. Because it's an approved market index, the inevitable will have happened. Financial engineers would have found crafty ways to structure an investment vehicle where performance is tied to movement of the index. Thus, we hear about hedge funds or daring traders who either made much money trading the index or lost gobs of it because they bet markets would continue to be stable. The media, also, like to call it "the fear index." Technically, the index, administered and computed by the CBOE and launched about 25 years ago, tries to compute expectations of oncoming volatility, not necessarily calculations of volatility just past. Therein exists apparent confusion about what the index intends to convey. Past volatility or expected, upcoming volatility? Most traders, brokers, and analysts understand concepts of volatility and certainly know it when they observe or experience it. Volatility is watching the S&P stock index rise 3 percent one day, fall 7-10% the next, another 2-3% the following day, and finally rise again 1-2% days later. Stomach-churning volatility, some will say. Some investors and market commenters mistakenly consider the index as a computation or reflection of recent market volatility. The index, more precisely, is a reflection of anticipated or expected volatility, based on the volatility captured in options prices. A technicality, but an important nuance. While the intent is to measure expected stock-market volatility, the approach is to compute that expected volatility by observing current options prices. Let's allow options markets to suggest what oncoming volatility will be in stock markets. Options prices (whether they are options on single names or options on a basket of stocks) are determined to be a function of several factors: (a) the underlying stock price, (b) interest rates, (c) the time to expiration, and (d) volatility of the underlying stock. The four factors are not difficult to rationalize and understand. The value of a "call" option should rise if the underlying or referenced stock increases. The value of the option might rise if given more time between now and expiration date. And the value of the option could rise if there is movement in the underlying stock, especially positive, upward movement. If the stock has fluctuations and is subject to volatility, then there is an increased probability that such movement could head in an upward direction. Hence, an increased probability that the stock might increase in value. That, of course, suggests increasing value in the option. Finance graduates everywhere are familiar with Black-Scholes options-pricing models, which account for these factors and present ways to compute precisely the value of an option. If I own an option to purchase a stock at price 25, and the price is 25 today, I might conclude quickly the value of the option is zero. However, if the option expires in five years and the stock price is expected to fluctuate, then time might permit the stock price to rise, say, to 30. The option, therefore, will have value because of what the stock price might be in five years. How high could that underlying stock rise--within a certain degree of probability, over a certain time frame? Stocks that have histories of movement and fluctuations are likely stocks that can reach certain levels with higher probabilities than stocks that sit still in price for long periods. Similarly, stocks that have expectations of volatility in ensuing periods might be more valuable than the stocks that have expectations of minimum movement. Options prices, therefore, reflect expected volatility, as much as they reflect historical volatility, although history can certainly influence expectations. Options prices on active markets and exchanges account for underlying prices, time to expiration, and interest rates (thanks to the pricing models), and they account for expectations of volatility. Based on current options prices, we can derive the market's perceptions of forward-looking volatility. VIX calculators "extract" expected volatility from current options prices to determine how the market perceives upcoming fluctuations. More specifically, it examines S&P options (or options on a basket of S&P stocks). That makes sense, if the index strives to capture market volatility and not specific single stocks. Volatility measurements are as straightforward as calculations of variance and standard deviation from a statistics class. In this case, volatility is inferred from options prices and then interpreted in terms of standard deviations. Or the current price of an S&P option will imply that volatility is, say, 10% (or one standard deviation equal to 10%). The VIX measure infers standard-deviation measurements from S&P options (over 30 days) and then quotes it based on one year. In sum, VIX provides market perception on expected movement (up or down) over the next year one year (with about 68 percent confidence). So what does it mean when VIX jumps to 20, as it has in recent weeks? Or 19.8 as of March 29? 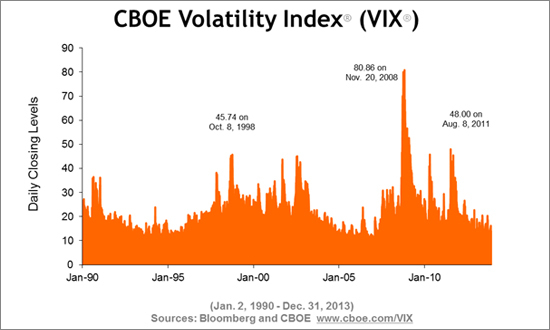 What does it mean if VIX hovers in single digits as it had been in recent years? A lot of volatility. A lot of stock-market bumbling up and down in the year to come. Will the market decline by 20%? Not necessarily. VIX suggests market participants see it as something plausible. But keep in mind a VIX measurement, in theory, suggests markets can rise by 20% over the next year, a phenomenon many participants say is not plausible. As with much of finance, the tool (VIX, in this case) should guide, not dictate or foretell.